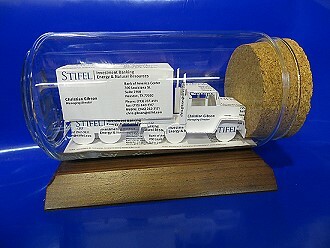 Great gift idea for a trucking industry executive! 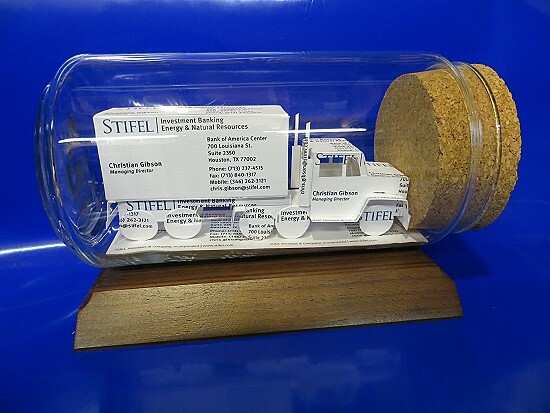 Our 18 Wheeler sculpture is made from business cards and makes a unique gift or award for employees with 5, 10 and 25 years of experience trucking. We’ve also sold them for use as safety awards. More gift ideas for truckers. We have more than 60 business card sculptures under glass including 10 trucks, the Patriot Eagle, the popular doctor and golfer! They’re a great gift because they are personalized using the recipient’s business cards.